As a mum, we care a lot for our children. And sometimes, the over-concerning me tends to worry too much... Do you? Or Is your mum worrying too much for you? Well, I guess all mums are the same... we love our children too much. 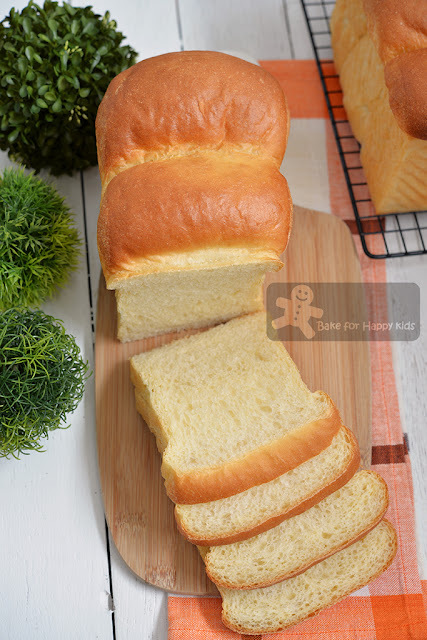 White breads that are made with plain white flour are mostly energy loaded with less vitamins and minerals as the processing of white flour has lost lots of its fiber, vitamins like vitamin B1, B3 and E and minerals like calcium, iron, folic acid and phosphorus. 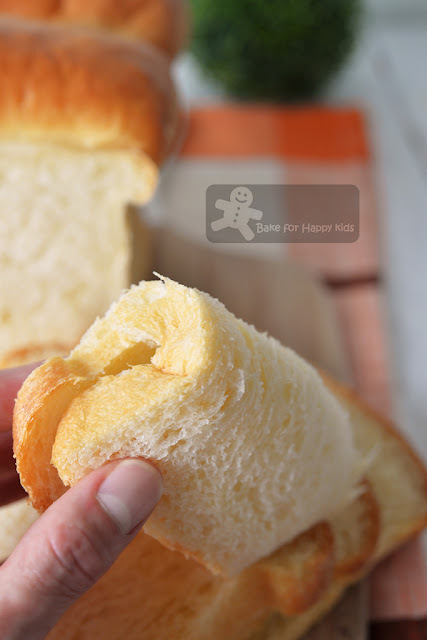 To boost the nutritional value of white breads, these nutrients are added back into white flour again to make enriched breads which will eventually contain the nutrients that were lost during the processing of flour. Instead of adding vitamins and minerals in the form of chemical or processed powder form, I have added these extra nutrition in the form of eggs and milk into my enriched bread. Isn't this better? You might ask... Isn't wholemeal bread better than enriched bread? Totally agree! Unfortunately, my fussy son said that wholemeal breads taste like "cardboard" and prefers soft white bread way more than wholemeal bread and I was asked not to bake any wholemeal bread for his school sandwiches. Hmmm... Regardless, I will try to convince my son to like wholemeal breads and hope that one day I will achieve that. Hence, if you are a mum like me who bakes sandwich bread for your children's school lunches, why not try this recipe? These milk and egg enriched breads are pretty impressive with soft spongy texture, delicious milky taste and nice chewy crust. Very delicious with its soft spongy texture, milky taste and fragrance and a nice chewy crust. "Mum, can you trim off the crust of the breads so that I can enjoy only the soft white part of the bread?" Hearing this, I gave my son a dirty look and replied "Too bad that these breads have these chewy crusts and you just have to eat them." "Sorry, mum. I just can't eat these crusts and so I threw the crust away." Anyway, here's a video showing how I baked these yummy bread. Please note that this bread dough will be sticky but very elastic and spongy and it is better to knead the dough using a breadmaker or an electric mixer with hook attachment, not by hand. Here's the recipe that is adapted from a fantastic bread rolls recipe at here. extra milk to brush loaves before baking, optional. This step will give the bread a nice colour and also chewy crusty top. If you are using a breadmaker to knead and prove, add all ingredients into the breadmaker according to this order. Use "dough" setting to mix and knead dough for 30 mins or until the dough is elastic* and allow the dough to prove for 1 hr. If you are using an electric mixer with an hook attachment to knead, combine all ingredients except butter in the mixing bowl and mix at low speed until a soft dough forms. Then, knead in the butter until incorporated. Continue to knead at low speed for at least 25 mins or until the dough is elastic*. Cover the dough and allow the dough to prove in a warm and humid place for about 1 hr or until doubled in size. *Please note the the surface of the dough won't have silky smooth but look rather spongy-like. Grease 10 x 20 cm loaf pan/s with butter or vegetable oil spray. Divide dough into into 6 equal portions. Shape all portions of dough into smooth balls. Allow them to rest at room temperature for about 10 mins. Brush the top of the dough with milk and bake bread in a preheated 180°C (350°F) oven for 25 mins or until the bread are thoroughly baked. 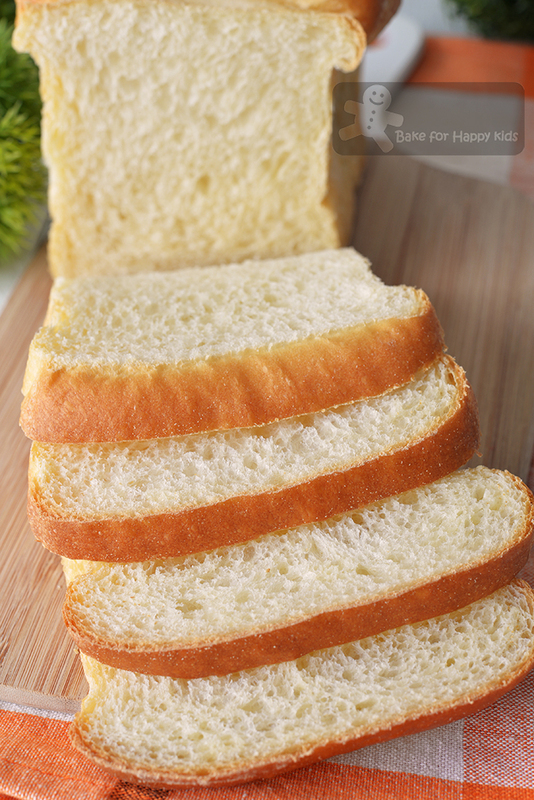 Remove breads from the loaf pans and transfer immediately onto a wire rack to cool completely before slicing. To store, wrap tightly in plastic wrap and keep at room temperature for 2-3 days or freeze in serving portions for 2-3 months. hahaha do I worry! that would be an understatement LOL. love the bread looks so nice and soft. Maybe I should try baking bread more often but breadflour is sooooo expensive over here and usually disappears right after the fasting month. You have to knead your bread dough until it is very stretchy and relaxed. 25 mins is pretty much the standard kneading time. Good luck for your baking! Your bread looks yummy. Will try this weekend. If I use salted butter can I omit salt. Yes Millie. Please omit salt or reduce by half if you are using salted butter. Cheers! May I cut half the recipe to make smaller bread? Yes, you can. Half of this recipe makes one 10 x 20 cm loaf. Cheers! Hi, may I know which brand of bread flour you used? Wallaby Bakers Bread Flour. It's an Aussie brand commonly found in Coles and Woolies. Cheers!